This movie is set in an alternative future in which everybody stops aging at 25, but on reaching that milestone, you need to earn time to top up a clock located on your wrist; if you fail to do so, you'll drop dead. In this world, those rich in time live forever in exclusive areas of the city, while the poor work, beg or steal in order to avoid their body clocks running down. Justin Timberlake plays a put upon drudge from the city's 'ghetto' who unexpectedly comes into a windfall of 100 years from a suicidal businessman. With his newfound fortune, he is able to access the rich and decadent world of the immortals, and ultimately goes on the run with a wayward rich girl (Amanda Seyfried), as they seek to play Robin Hood and do a little time redistribution... To be honest, I went into this one as an Orange Wednesday with pretty low expectations - and all I really say is that I'm glad I wasn't paying full price for the experience. It's a pretty interesting concept on paper, but the execution is off in a number of different ways. Some of the acting is pretty poor - I liked Timberlake as the charismatic web entrepeneur Sean Parker in The Social Network - but here he seems a little out of his depth , and struggles with scenes in which he's required to emote. Another issue I had with the movie is that the set design, special effects and costumes seemed to have been put together on the cheap, with the effect that rather than seeing dystopian future, I was always aware that I was just watching some actors run around some industrial parts of the greater Los Angeles area. Finally, there were a high number of plot holes and implausible situations in this picture. Like - how come you can access a bank's safe by driving through its plate grass windows in a truck? Why doesn't Cillian Murphy (as a time cop on the trail of the two leads) bother to top up his time when he's so close to dying? How the hell is Timberlake's magic arm wrestling manoeuvre supposed to work? And that's just scratching the surface. On the plus side, the movie does star Amanda Seyfried, who's pretty easy on the eyes, as well as Vincent Kartheiser (Mad Men's Peter Campbell) who's good value as the villain of the piece. I suppose I wasn't exactly bored watching the movie, and it wasn't like I was ever tempted to walk out, but it fails in too many areas for me to give it a passing grade. 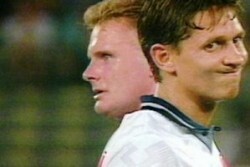 A recent documentary which looks back at England's World Cup campaign in 1990, when Bobby Robson and his boys came heartbreakingly close to winning the trophy on foreign soil for the first time. For me, this was a welcome wallow in nostalgia; I was eight years old during Italia '90 and fascinated by football, so I have vivid memories of that tournament which I really enjoyed reliving. It was also interesting to see the ways in which the players acted - back then, football wasn't the megabucks business it's become in this day and age, and the players (particularly Gazza) act in a natural way, mercifully free of all the media training which today's players receive. Despite the all that, I can't rate this documentary too highly, and it's mainly for one reason - the editing of the match sequences. Rather than just using footage from the England games in question, the filmmakers have decided to splice in close up footage (which is supposed to be of the players at the time, but has obviously been shot recently), which has a jarring effect and on occasion means you can't even see the goals being scored. England's journey at Italia '90 is a fine story and one dear to my heart, but I feel the way it's been told here could do with some work. After he starred in a number of turkeys like Gigli and Pearl Harbour, Ben Affleck's stature as an actor was pretty much shot. He managed to turn that around (to some extent) by directing and starring in the gritty Boston crime drama Gone Baby Gone. This is his follow up to that movie, again set in a working class Boston neighbourhood, but this time focussing on armed robbery rather than kidnapping. Affleck plays Doug MacRay, the leader of a gang of bank robbers, who falls in love with a bank employee (Rebecca Hall) who had been kidnapped by the gang in their most recent raid. MacRay initially tracks the girl down in order to see whether she is likely to give his gang away to the FBI, but as their relationship progresses, his affection for her leads to him questioning whether he should be pursuing a life of crime. However, Affleck's chief lieutenant (Jeremy Renner) keeps pushing him to commit bigger and bigger scores, despite the authorities increasing interest in the gang's activities. I wouldn't say I was blown away by this movie, but it was solidly entertaining, if a little on the long side. Rather like the '90s heist drama Heat, The Town features long sequences in which the crims question their choices in life, followed by explosive set pieces in which the robberies take place; the most memorable of which sees the gang enter into a pitched battle with the police on the streets outside Fenway Park. 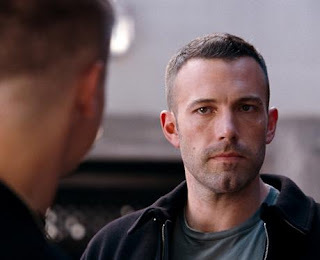 Affleck has assembled a pretty impressive cast for his second effort as a director, and the likes of Pete Postlethwaite, Jon Hamm and Jeremy Renner all put in solid work. I'm not sure that he's quite banished the ghosts of the series of stinkers he put out not so long ago, but Affleck is definitely rebuilding his reputation as a credible performer and director. Dario Argento's sequel to the brilliant Suspiria is another bloodcurdling tale of witchcraft and grisly murder. In this picture, it is established that there are three powerful witches who control the world: Mater Suspiriorum, the Mother of Sorrow (who was dispatched in Suspiria); Mater Tenebrarum, the Mother of Darkness (who is the main antagonist in this movie), and Mater Lachrymarum, the beautiful Mother of Tears (who appears briefly in this film, but would have to wait until 2007 to get her own movie). Unfortunately for Mark Elliot and his sister Rose, they both have the misfortune to choose to live in houses occupied by the two remaining witches. This is a hard film to assess - on the negative side, it's poorly scripted, some of the scenes here are laughably bad (my favourite being the bit where the crazy old antique seller decides to try and drown a sack full of cats, but instead falls into the river and finds himself being eaten by rats. We know this because he keeps shouting "I AM BEING EATEN ALIVE BY RATS!" at the top of this voice); the plot makes little or no sense; the characters act like idiots, making some ludicrously stupid decisions; and some of the acting is really, really bad. Despite all of the above, I still kind of liked this movie. Argento is able to create almost unbearable tension at times, with some terrifying scenes in which our protagonists are stalked around dark spaces by barely seen, black gloved assailants. The movie is beautifully shot and undeniably stylish, with Argento using some wonderfully vivid colours in the decor of the haunted houses. For me, it's a deeply flawed picture, with brilliant highs and embarassing lows - but a film which has moments which will probably stay with me far longer than anything in any of the other, more conventional films I've seen this week. Another week, another David Cronenbourg film that can be checked off my list. (Of DC's major releases, I think the only ones I still need to see are Shivers, Naked Lunch and Crash. I probably shouldn't watch those three as a back-to-back triple bill unless I fancy spending an extended period of time with a psychiatrist afterwards...) Spider is one of Cronenbourg's more recent offerings, and though it lacks the visceral shocks of his earlier movies, it's just as disturbing, albeit in a slower, subtler way. 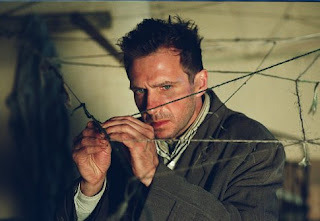 The film tells the story of Dennis "Spider" Cleg, a severely disturbed man in his 30s (played by Ralph Fiennes). Mr Cleg has recently been released from the mental institution where he has spent most of his adult life into a halfway house, located in some dingy, anonymous part of London. Once there, he withdraws from the company of the fellow residents, instead spending his days running through a series of traumatic events from his childhood. Though a little slow paced, this is a fine film and features a wonderful lead performance from Ralph Fiennes as a mumbling, shambling husk of a man, forever haunted by his tragic past. As a paranoid schizophrenic, Cleg is the definition of an unreliable narrator, so we are never quite sure if what we are seeing is something which really happened, or is just the product of his fevered imagination. As part of Cronenbourg's efforts to ensure that we look at the world through the eyes of a paranoid and delusional individual, he uses Miranda Richardson in three different roles - intially as Spider's affectionate, idealised mother, but also as the tawdry prostitute who begins an affair with Spider's father, and finally (in the latter stages of the film) as the unpleasant landlady of the halfway house. It's another brilliant film by David Cronenbourg, one which rewards the viewer's patience with a powerful climax, in which we realise what has really transpired in Spider's past, and the reasons why he has ended up in such a terrible place (both literally and figuratively). My second trip to the cinema this week turned out to be a much more worthwhile experience; in stark contrast to the disappointing In Time, Moneyball is a highly polished film which is likely to be in the running for a few Oscars next year. Based on the bestselling book by Michael Lewis, the movie is a fictionalised account of the fortunes of the Oakland Athletics baseball team in their 2002 campaign. 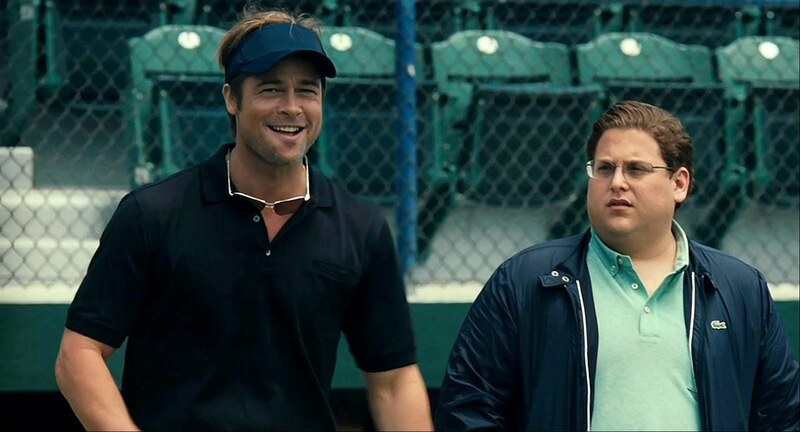 In particular, we look at the way the team's General Manager, Billy Beane (Brad Pitt) decides to use the statistical knowhow of Yale economics graduate Peter Brand (Jonah Hill) in an effort to gain an advantage over teams with far higher payrolls. In taking this approach, Beane angers the majority of the scouts and coaches within his organisation, who seek to rely on the old fashioned, less tangible methods of evaluating a player's worth. For me, the film works largely because of an excellent script from Aaron Sorkin and Steven Zaillian, who give Brad Pitt some fantastic dialogue to deliver as the charismatic Billy Beane. A number of actors in supporting roles also do a good job, particularly Jonah Hill who is cast against type as the rather shy, ineffectual Brand. I should also mention the crisp, beautiful cinematography provided by Christopher Nolan's regular director of photography, Wally Pfister. 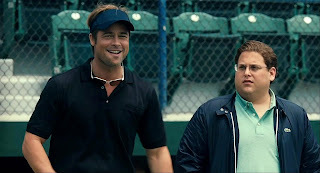 As a minor caveat to what I've stated above, this is a movie where some knowledge of baseball is required; for those people without a rudimentary grounding in the basics of the game, the discussions between Billy Beane and Peter Brand may well seem to be incomprehensible. Still, if you are a fan of America's national pastime, it's definitely one to catch.